DailyMirror sat with former Education Minister, UNP strongman and current ambassador to Sri Lanka in China, Dr. Karunasena Kodituwakku for an interview during a visit to the island. Dr. Kodituwakku spoke about Sri Lanka-China relations, Chinese investments in the island and politics. Following are excerpts of the interview done with Dr. Kodituwakku. Q China has become the biggest donor and investor in Sri Lanka. How do you see this development? Yes, with the two mega investment projects of leasing the Hambantota Port and the ongoing Port City Project in Colombo in addition to other medium and large investment projects involving China in tourist-related and other industrial investments, China emerged as the largest foreign direct investor in Sri Lanka during the year 2017. However, I don’t know the exact figures with regard to China being a donor. Donations normally include financial assistance grants, which are not loans, and loans that are given on concessionary terms -having very low interest compared with the prevailing market rate- long grace periods to commence repayments and a longer period for full payment to be made, etc. I am aware that the Chinese Government provided financial grants worth RMB 600 million in the year 2017 to build a Kidney Hospital in Polonnaruwa. This grant was given when President Maithripala Sirisena made an official visit to China and assured a further RMB 2 billion during 2018 and 2019 when Prime Minister Ranil Wickremesinghe met the Chinese President in May 2017. In China, no one is above the law. Our problem is that the majority of our people are not committed to observing the law. Discipline is the foundation for a peaceful society. Q But the joint Opposition always has something negative to say about this close cooperation, friendship and help extended towards Sri Lanka by China. Your comments? Since I am giving this interview as the Ambassador representing Sri Lanka in China, I do not wish to respond to the views of the joint Opposition (JO). However, I would like to comment on the negative views expressed with regard to China’s involvement going by what I have seen in media. Whenever a new project or a policy is introduced, a common feature in Sri Lanka is that some people tend to imagine its negative possibilities rather than its positive impact. I would like to quote an interesting story that was related to me by a senior member of a leftist party in Sri Lanka who visited China a few months ago. He told me that when economic reforms were introduced in China by the late Deng Xiaoping in late 1970s, they were very critical and considered those reforms to be as reactionary as well as counter-revolutionary. I told him that such irrational critics were fortunately in Sri Lanka and not in China. That is why today, China is a US$ 12 trillion GDP economy and Sri Lanka is still a US$ 85 billion GDP economy. Since you mentioned about the JO, I would like to invite them to read the agreements signed by the two Foreign Ministers of China and Sri Lanka when the Chinese President visited Sri Lanka in 2014. The President of Sri Lanka at that time was the current JO’s leader when Mahinda Rajapaksa led the regime. In those agreements, the two countries have clearly agreed to operate the Magampura / Hambantota Port Project jointly. Therefore, it would be better to study those agreements before anyone makes further comments. Q Did Sri Lanka actually sell the Hambantota Port, a portion of reclaimed land of the Port City, and vast extent of land in Hambantota for an investment zone as conditions of the various development agreements that were signed between the two countries in the recent past as claimed by the JO? In addition to the agreements signed in the recent past, there were agreements that were signed in 2014. As far as I am aware of, the agreements signed recently have given land and the Sea Port on long lease because no investor will invest further if there is no guarantee for a long period of lease. When the value of an investment is huge, it is natural that any investor would demand a long lease. Do not forget that the investment that was already made was huge and that that investment in addition to the due interest must be paid on time to retain the credit worthiness of Sri Lanka. In addition to that, the next stages of the Hambantota Port must be built because otherwise what we have already invested with credit facilities will be a waste. The conditions of the agreements between the two countries have been honoured in the past as far as China is concerned. Hong Kong was returned to China in 1997 after 150 years since the Opium War days. Similarly, Macau was returned to China after 500 years by the Portuguese. Q How will these negative comments by the JO affect Sri Lanka – China relations? Naturally, when negative comments are made, any investor would think about them. However, fortunately, most Chinese investments are made with the blessings of the relevant Government agencies, both national and provincial. Therefore, I do not think they would change their mind due to such negative comments. Chinese investors consider the advice given to them by their Government agencies. Q Do you think Chinese investors will think twice before investing in Sri Lanka because of these negative comments by the JO? The only comment I would like to make again on the same subject is that we have missed many opportunities since Sri Lanka introduced reforms in 1977 due to this kind of irresponsible comments and the armed rebellions we have had in the past. No country can develop in isolation. The message I would like to convey here is that China has repeatedly given two fundamental reasons for its economic success: (a) the economic reforms introduced in1978 (In fact, this year, China is making arrangements to celebrate the 40th anniversary of the introduction of these economic reforms) and (b) the joining of the World Trade Organization (WTO) in 2001, which paved the way to export Chinese products to almost all the countries in the world, making the China the world’s factory. Q As an economist and diplomat, what do you think Sri Lanka must do to attract more Foreign Direct Investments (FDI)? What we must do with regard to attracting FDI is to speak to the world in one voice, regardless whether you belong to the Government, opposition or function in any other capacity. We must understand the reality – that our capacity to invest is limited. All the countries that developed rapidly during the past 5 to 6 decades did it through FDIs. As the second-largest economy in the world today, China did it over the past 4 decades with the support of FDIs. South Korea, Taiwan, Hong Kong and Singapore, which are known as economic Tigers, achieved rapid development with FDIs. Indonesia, Malaysia and Thailand, which followed the economic Tigers, did it in the same way with FDIs. Our largest neighbour, India, did it as well starting as early as in the 1990s with the blessings of FDIs. Q China was considered a poor third world country in the 70s. During my visit to China last November, I witnessed an unbelievable industrial, IT and infrastructural revolution taking place in China. How did the Chinese people achieve this development in such a short period of time? Yes, you are correct. When the Chinese Communist party’s political leadership, headed by Deng Xiaoping, decided to introduce economic reforms in 1978, the whole party machinery and bureaucracy collectively supported and backed the reforms. These reforms were first introduced on the basis of a pilot project in Shenzhen, the fishing village close to Hong Kong. In fact, it is one of the first projects that was implemented by the China Merchant Group, which leased out the Hambantota Port, in addition to their terminal in Colombo Port. This is why some analysts in China claim that China’s economy is now transitioning from being a ‘World Factory’ to a ‘World Market.’ The strength of China’s consumer market would be US$ 9 trillion by 2030. That is why more and more countries want to sign FTAs with China. Q One of the rare setbacks in the Chinese society I witnessed was the poor knowledge of a second language or that of a another global language which creates a communication gap. Do you agree? China has 1.4 billion people and out of them the majority use only their mother tongue. However, there are more and more people communicating in English, particularly students in universities and employees in the corporate sector. They are now using foreign languages and not only English, but other languages such as Japanese, French, German, Spanish, Russian, Korean, etc. Young people are very keen on learning English and whenever they need to understand better, they simply touch their smart phones to access the correct understanding in Chinese. Q One of the biggest differences between Sri Lanka and China that I have observed was the lack of discipline among Sri Lankans while the Chinese are an extremely disciplined and law-abiding nation. Your comments? Yes, you are correct. In China, no one is above the law. Our problem is that the majority of our people are not committed to observing the law. Discipline is the foundation for a peaceful society. Q You have served the country for nearly four decades as a politician (Education Minister), an academic (Vice Chancellor) and a diplomat (Ambassador to Japan, South Korea and China). 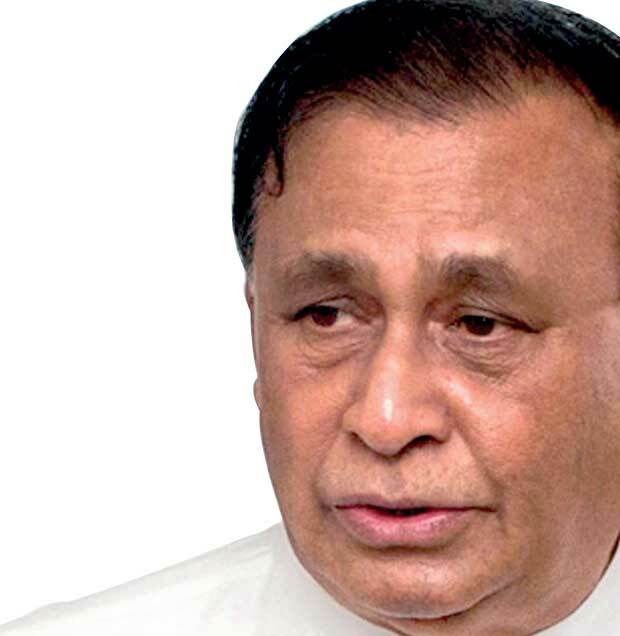 Don’t you have any intentions of re-entering politics, contesting the elections and becoming a Minister in a future UNP Government? Diplomacy is international politics. A unique aspect in the various roles of my career has been the fact that I was entrusted to do jobs I never expected. I became a Vice Chancellor not because I wanted it, but the then Higher Education Minister President Jayewardene asked me to take over that position due to the troubled situation that prevailed at the Sri Jayewardenepura University in 1982. I was appointed as Ambassador to Japan, again by President Jayawardene’s Government, in 1987 due to the unsettled situation that prevailed in the country. At that time, even Vice Chancellors were being assassinated. Then President Premadasa, who became the President in 1989, appointed me to South Korea as the Ambassador there. Then in 1993, the then President D. B. Wijetunga asked me to be his Governor of the North Western Province, again without any request being made by me. Then I contested and was elected to Parliament in 1994, as I wanted it at that time. That was a unique opportunity I got as I expected. However, although I never dreamed of being the Education and Cultural Affairs Minister, I was given these portfolios by the then Prime Minister Ranil Wickremesinghe. I am an Economist so I expected a portfolio that was relevant to my professional background. Then again in 2015, I did not expect to be a diplomat again, but it was my destiny, and that is why I am here. Therefore, I do not know what my next responsibility may be. My past experience has been that I was given what I did not expect.Therefore, I leave the rest also to my destiny! Q You took the initiative to arrange the marriages of 50 young Chinese couples in Sri Lanka in a glittering ceremony at the Town Hall Grounds in Colombo. Could you briefly enlighten our readers as to what was the procedure adopted to select the bride and groom, and whether this is going to be an annual feature in Sri Lanka’s tourism calendar as well as who funded the event? Finally, I would like to say a few words about the responsibility of the media, which has an enormous responsibility in nation building. Although I am a trained academic professionally, I have no intention of teaching anyone, but rather wish to stress the importance of understanding the critical responsibility of the media profession when communicating with the masses. It is easy to inflame, but it is not that easy to prevent a fire spreading when it becomes a wildfire. Finally, the whole society will pay for it. Sri Lanka has already paid heavily for the fires that have been inflamed by some since independence. Dr Kodithuwakku is a honorable man with highest level of integrity. He should be the leader of UNP and the Prime Minister of this country. Not in the cesspool called parliament.